Who would you need to be in order to run a business ten times your size? From the get-go, many entrepreneurs dream of growing their businesses and building larger, more successful ones that generate substantial profits and are household names. The unspoken rule (sometimes erroneous) of all businesses is that we must grow year on year, even if it’s just to compensate for inflation. When I started my business, I believed it would automatically grow annually. What I didn’t know back then was that I, myself, would also need to grow on a personal and psychological level if I wanted my business to expand. “Who would you need to be in order to run a business ten times your size?” my mentor asked me when I started out. And when my business achieved ten times its size, he asked me this question again. The process of him continually asking me this same question forced me into a state of self-reflection and personal gap analysis that drove my personal development agenda, ensuring that my business would grow as far as I would grow. I don’t have any heroes, and yet if you walk into my office you’ll see a framed magazine mounted on the wall with Adrian Gore, CEO of Discovery Ltd, on the cover. My high regard for him is not only based on what he has achieved, but more specifically on who he has become in order to achieve what he has. He took an idea and turned it into a listed multinational business with a market cap of R67.4 billion. Gore clearly had the ability and commitment to grow into someone who could lead a multinational business from the first day that he started Discovery. “Do you have the personal characteristics of someone who is running a business your size, or those of a person running a business ten times your size?” my mentor would ask. A very valuable lesson I learned was that the person that you need to be to run a small business is not the same as the person that you need to be to run a medium-sized business, or the person that you need to be to run a large business. If you are small minded then your business will remain small; if you are large minded then your business will have to catch up to you. 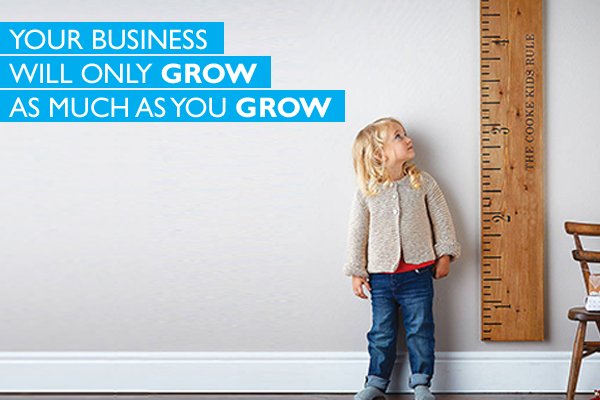 It’s less about the size of the business and more about who you are at a point in time. It takes constant work, personal development, struggle and commitment to being a better leader and businessperson than you were the year before. I recently had to make a tough business decision that was right for my business and its future. Had I been faced with the identical set of circumstances five years ago, I know I would have made a different decision because in the past my decisions were based on things that would keep my staff happy and make them like me. Over the last five years, I’ve done work on myself and learned that my decisions must be based on the right things for the business and its future, even if they leave staff feeling momentarily upset. Practice self-reflection and embark on a personal journey that will help you discover who you have to be. If you don’t do this, YOU will be the largest impediment to your business’s growth. Who would I need to be in order to run a business ten times my size? Do I have the commitment to do the personal development work to run a business ten times my size?